We’ve seen a lot of advancements in lasers, from ones that could one day start up a fusion reactor to ones that can transfer energy wirelessly. Now scientists from National Physical Laboratory and Imperial College London are looking to bring back something even cooler than lasers--masers. No, masers are not just a word that we came up with just now. They’ve actually been around since the 1950s, before lasers were invented. The problem is that they’ve always been impractical--that is, until the team of researchers came up with a device that could let masers over take lasers in the coolness race. Masers (short for Microwave Amplification by Stimulated Emission of Radiation) are much like lasers in that they are concentrated beams of energy. The key difference, though, is that they're beams of microwave energy rather than light. The reason you’ve probably never heard of them is because they require extreme conditions in order to work. 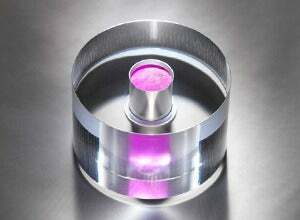 The masing process needs a hard crystal, such as a ruby, to amplify the microwave energy. The process also requires powerful magnetic fields as well as ultra-low pressures that are either created in a vacuum chamber or with super-cold temperatures to lower the atmospheric pressure. To circumvent these obstacles, the researchers developed a device that uses a new crystal made of p-terphenyl doped with pentacene. The new crystal can produce the same masing process at room temperature without any applied magnetic field. Unlike lasers, masers can pierce though cloud cover, living tissue, and other solid materials undisturbed. Its ability to penetrate could make it particularly useful in the medical field with higher-definition body scanners or an even more accurate maser-based space telescope. After seeing all the advancements in laser technology over the last few decades, who knows what might be possible with masers now that scientists have removed its barrier to research. The study on the new maser generating crystal appears in this week’s issue of the Nature journal. Lasers or masers? Leave a comment. Famous Videogame Characters Done In Traditional Ukiyo-E Style? Game On!